Before you make a purchase, let Kinnek do the hard part. Submit a free request for quotes using the form to the right, and we'll get multiple suppliers to provide you with their popcorn concession equipment offerings and pricing. This way, you can compare all your options in one place! Whether it’s sold from a permanent stand at the movie theatre or from a mobile stand at a ballgame, freshly made popcorn continues one of the biggest sellers in the concession business. Popcorn equipment isn’t particularly complicated, but there are a number of considerations you should take into account before rushing into a purchase. You’ll have to think about cost, safety, and ease of use, of course, but also how much floor or counter space you’ll have available, and if you operate a mobile concession stand you’ll want to figure out beforehand if you’ll have regular access to electricity. You’ll also want to consider whether, at any point in the concession process, you want there to be a self-service option. Finally, consider your production needs. A high and steady volume of popcorn sales may necessitate different storage and serving equipment. Suppliers often customize their products to expand the feature set, so if you have any specific needs, do speak with the supplier about them, as their may already be a customized product that meets those needs perfectly. Popcorn poppers are the main event, and because they are so visible to the customer, the popper cases come adorned with all sorts of fanciful designs. If you’re not interested in the more gaudy, colorful designs, consider a ‘contemporary’ themed popper. Contemporary popper colors are muted and the design is minimalist, which some buyers believe gives off an impression of higher quality. The kettle of a popcorn popper is where the popcorn is made, and its located in the center of the popper cabinet, hanging low from the ceiling. Oil and kernels are poured into the heated, nonstick kettle, thus popping the kernels. The kettle then releases the popped kernels into the cabinet below. The cabinet itself is heated too, which keeps the popcorn warm for serving. Selecting the right kettle capacity for your popper is fairly straightforward. To calculate the production of your popper, simply multiply your kettle capacity by the time it takes to finish popping a full kettle of kernels. If it takes two minutes to pop, for example, and your kettle capacity is 8 ounces, then your popper has a production capability of 4 ounces of popcorn per minute. There is no ‘one size fits all’ for production needs, as some concession stands see far more volume of business than others. As a general guide, however, most mobile concession stands do fine with poppers in the range of 5 to 12 ounces, while most permanent/fixed concession stands operate with larger poppers, from 30 to 60 ounces and even more sometimes. Production needs are a great starting point for a conversation with a supplier. Speak with your suppliers to learn more about similar businesses and how they fared with various kettle capacities. You’ll also have a choice of gas or electric. Most permanent/fixed concession can choose between gas and electric, since they usually have access to electrical outlets, but for mobile stands, it may be the case that there is no electrical outlet available. Once popcorn is made in the popper, employees can transfer the popcorn to a staging, or serving cabinet. All cabinets are heated, and, like poppers, they are frequently decorated with various colorful designs, so whichever type of display cabinet you end up purchasing, do make sure that you’re satisfied with the design. Again, for a more muted design, consider a ‘contemporary’ themed cabinet. For concession stands selling larger volumes of popcorn, such as at movie theatres, drop-in staging cabinets are very common. When the customer orders, the employee can simply open the lid and use a scoop to fill popcorn into a serving tub/box. For smaller volumes of popcorn, a standard, countertop staging cabinet can be used. With smaller staging cabinets, some are customized with shelves to fit pre-filled popcorn tubs. Many concession stands prefer to have the popcorn filled into serving tubs/boxes before being placed in a staging cabinet as they feel that the process is more efficient during busy periods. Choose shelved or non-shelved based on whichever strategy best fits your popcorn making process. Like poppers, you’ll also have a choice of gas or electric power. Your choice will depend largely on whether you have regular access to an electrical outlet, and whichever power source will be cheaper in the long run. There are numerous little additions to your concession stand business that will improve the efficiency of your process. First and foremost, consider a specialized popcorn scoop. 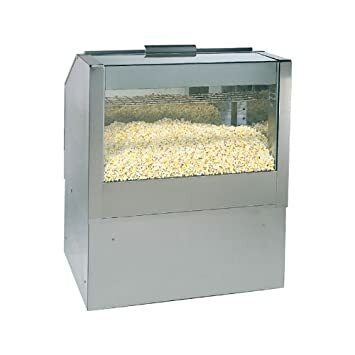 The scoop has a flared design, which makes it easy to lift large amounts of popcorn from the display cabinet (using the wide top of the scoop) and then to dispense the popcorn into smaller serving tubs/boxes (using the narrow bottom of the scoop). Second, rather than having your employees use their own subjective judgment to figure out the correct oil and kernel amounts when pouring into the popper kettle, you can simply bulk purchase pre-made popcorn packages with the correct amount of oil and kernels already measured. Your employees can just empty a package into the kettle, no measurement needed. This should speed up your process considerably and ensure consistency across popping cycles. There are two kinds of hot butter dispensers: pump and push-button dispensers, and they can be installed for self-service (having the customers pump the butter amounts they prefer into their own popcorn tub) or for your employees to add butter easily. Generally, smaller concession stands favor cheaper pump dispensers and larger concession stands favor push button dispensers because, while more expensive, they are easier to use. Keep in mind that all hot butter dispensers are electric-heated to keep the butter in liquid form, which means that you’ll need a nearby electrical outlet to use one. This may prevent some mobile concession stands from using hot butter dispensers. Optionally, some suppliers offer attached butter warmers for their gas poppers, so you do have options if you don’t have an electrical outlet but still want to provide fresh, hot butter.